The symptoms in Mill & Churchquarter were simple to spot. Somebody had sprayed the third of a hectare site with weedkiller and then did nothing else; dense, dead, rank, brown grasses matted 90% of the interior of the graveyard. The long grasses, when growing, made the graveyard surface perilous to walk across because of the hidden trip hazards which lay beneath. The weedkiller reduced the height of the grass but it lay in such dense swathes that the grass itself became a trip hazard . Why had the graveyard been sprayed? Why did the weedkiller not improve matters? From our perspective the weedkiller was a disaster. It killed the plants and countless insects but it didn’t improve access to the site and the spring of 2017 saw fresh grass growing up beneath the dead grasses. Our neighbours, the Burke sisters contacted local councillors and our local heritage group asking could we not revive the graveyard. Could we not make it accessible to the families who had people buried there. The Burke/de Búrca family were one of the last to have a funeral in Mill & Churhcquarter and in their now advanced years were unable to visit their family grave. Our first response to the Burke sisters’ call for help was to visit the site and do an inspection. The graveyard had an iron gate and entrance stile attached. The S wall was stone built and a second stile was located in the SW corner. The site appeared to be organised in two sections. Traces of a pathway running around the perimeter of the site were identified, albeit overgrown. This pathway is similar to a pathway found in Hacketstown graveyard 8km to the E. It appears these perimeter paths represent early 20th century ‘improvements’ to graveyards in the Drum hills. Mill & Churchquarter graveyard is situated at 88m above sea level and looks SW towards Whiting Bay. It is used for burials by families from Grange/Lisgenan parish and also Ardmore parish to the S & E. Some families from Monatrae/Piltown/Kinsalebeg, approx 4m to the W, also bury their people in Mill & Churchquarter. The ruins of a medieval parish church are present on the site along with an ogham stone which indicates a possible early medieval origin for the site. Ardmore cathedral also contains ogham stones and Kilmolash church (approx 10 km N of Grange) also contains ogham stones. This medieval parish church was recorded as being in ruins in the 18th century but a number of headstones date from that period so the graveyard stayed in use even if the church was superseded by a later church built at the site of Grange national school, which in turn was superseded by the Great Famine-era church at Grange townland over 1 km to the NE. Following the site inspection we decided on a grass cutting regime involving hand tools only. With strimmers and hedge cutters we cut the old dead grasses as well as the new growth which came through the 2016 growth. Grass cutting was repeated on an approx forthrightly basis in the Summer of 2017 and 95% of the site became accessible again. The mystery weedkiller sprayer re-emerged once more but only a small area of the graveyard was sprayed this time. While we cut all of the vegetation in the main graveyard we did not cut any of the overgrown hedges. Grasses and brambles proliferated at the edges of the site and we left these to encourage insect-life onsite in 2017. The graveyard is surrounded by a very well run modern farm and it is hoped to develop the biodiversity of the graveyard as a wildlife oasis within the modern farm landscape. A narrow stream runs 100m away to the immediate W of the graveyard. This stream ultimately issues into Whiting Bay. It is possible this stream had an affect on the location of the medieval church here, the stream may even have been an earlier medieval boundary to the church lands here. The townland name of Mill & Churchquarter is cimplimentary to the other place name of Grange - grange’s were ecclesiastical farming settlemwens associated with Augustinian Friars. As there were ‘Augies’ in Dungarvan and Youghal we cannot be certain to which foundation this grange was related. It may be hypothesised though that the townland of Mill & Churchquarter identify church-related agricultural functions of cereal crop growth and milling. A more substantial stream 300 m E of the graveyard may reward detailed examination in order to investigate the location of a medieval mill. Historic graveyard survey training was provided by Eachtra Archaeological Projects. Training was provided in Mill & Churchquarter as well as two other burial grounds in the broader area. The extension of the original scope of the project was a response to requests from adjacent community groups in Piltown and Clashmore. The standard Historic Graves system of number, photo, record and plan the graveyard was followed during this project and 98 grave monuments were recorded. 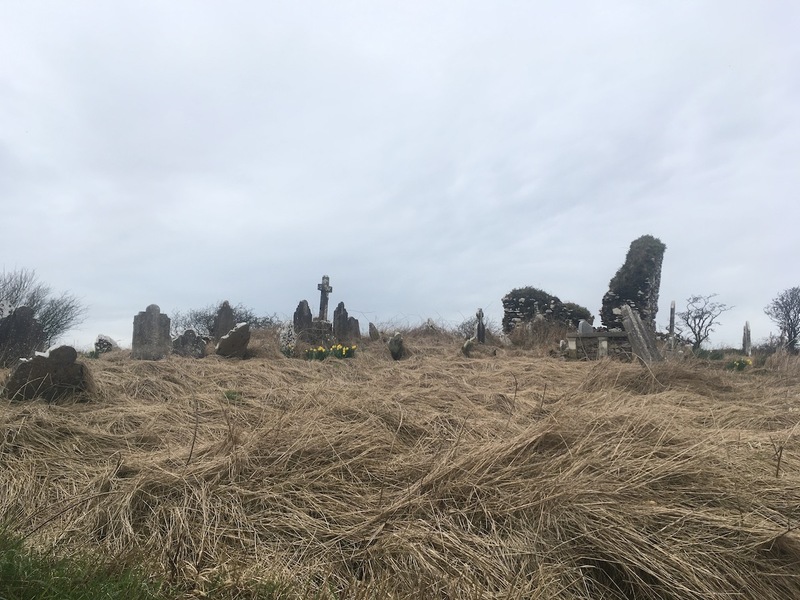 During the survey we have identified that this graveyard has headstones which belong in an E Cork/W Waterford group which includes, Killeagh and Clonpriest plus Youghal in County Cork and then Ardmore, Clashmore (St Mochua’s) and also Aglish graveyard. 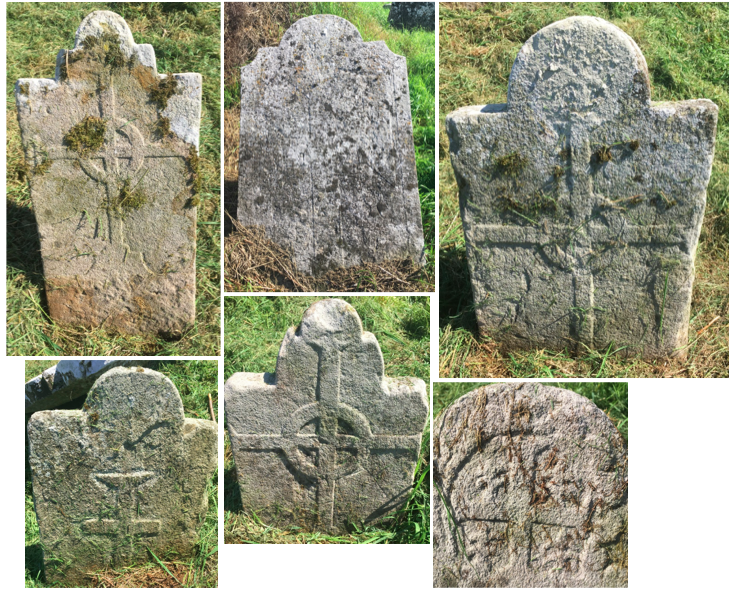 A series of 18th century headstones with crosses on their reverse-side are similar to headstones identified in Ardmore and Clashmore. This early group are made from local sandstones and are concentrated to the S and SW of the ruined church. 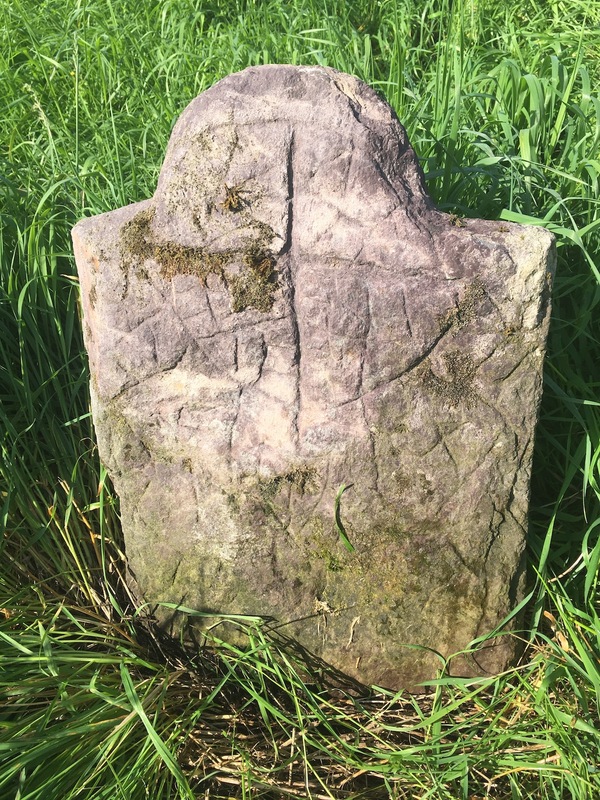 Very high quality early and md-19th century headstones are also present and these match gravestones in Killeagh, Clonpriest to the W and Hackestown to the E.
Interestingly, the E half of the site is predominantly occupied by uninscribed grave markers - these are arranged in rows and appear to be formal grave plot markers, just are not inscribed and are vernacular in origin. A number of iron crosses are present on site with the most interesting being wrought iron with a surviving name plate. Name plates rarely survive on iron crosses and this one states ‘In memory of Edmond Ahern, IHS’. 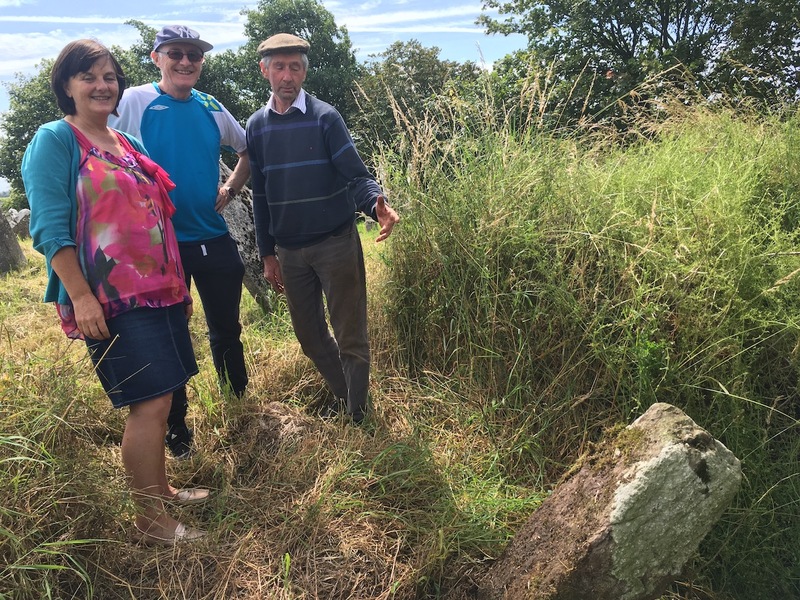 Iron working emerged as a topic of interest at this graveyard due to the identification of the burial place of a Mr jack Flynn who was a blacksmith in this area. Mr Flynn is believed to made a considerable number of field and farm gates in this area, stretching from ballybrusa to Cush and beyond. One of the graveyard visitors even showed us Mr Flynn’s old homestead as well as some of his gates. A neighbour also showed us some of the farm-related iron elements made by Mr Flynn and other smiths. We aim to pursue this topic, using the graveyard as a means to investigate the social history of the broader parish. As we worked in the graveyard we learned how the grass used to be cut in Mill & Churchquarter. In the old days, exact date undefined, one family had the cutting of hay in the graveyard & even potentially the grazing of the graveyard. Some parts of the country have a folk belief against taking anything from a graveyard but presumably this did not apply everywhere especially when such good grass can grow within a graveyard. For some reason this family did not continue the cutting of the grass and thereafter the council cut the grass for a while. The council cutting finished also and one local farmer continued the cutting but finally desisted when he was refused fuel costs by the council. Thereafter individual families cut their own plots, or pathways to their own plots and the organised element of care and maintenance was lost. And that is how we wish to revive the graveyard. We need to organise care and maintenance tasks. Potentially early medieval in date, definitely late medieval in date, Mill & Churchquarter has a long ecclesiastical heritage. 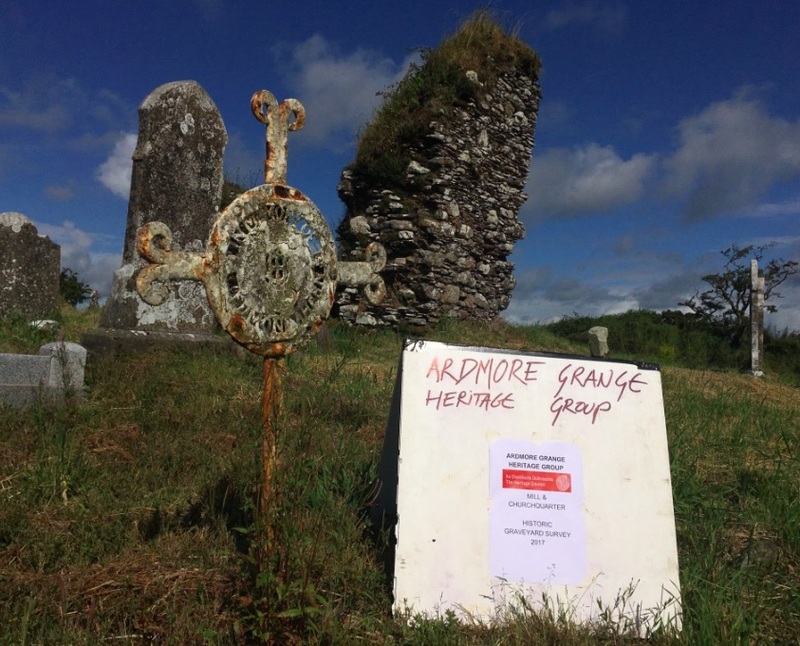 Our challenge in the 21st century is to engage the local community in minding our own burial grounds, albeit with the cooperation of the local authority who often have legal responsibility for any works which take place within the burial ground. If you wish to support this or any other community group to survey their graveyard then please consider making a donation to the project and write to john@historicgraves.com with any ideas you may have for surveys.